PROSPECT HEIGHTS — The puck stops here, Brooklyn. The New York Islanders announced Wednesday that they're moving to Brooklyn and making the Barclays Center arena their new headquarters. They'll hit the ice for the 2015-16 season, and have signed an "ironclad" deal to stay at the Barclays Center for the next 25 years, team owner Charles Wang said at a press conference at the downtown Brooklyn arena. "It's a great day for our city," said Mayor Michael Bloomberg. "Who said the rivalry between the Rangers and Islanders couldn't get any bigger? Well, it just did." Bloomberg said the new digs could help the Islanders "get some of their mojo back," noting that the team hasn't won a Stanley Cup since their glory days in the 1980s. The Islanders will keep their name and logo even though they're moving to a different end of Long Island. The Islanders are now based at the Nassau County Coliseum but the team's lease expires in 2015. Wang said Wednesday he has no intention of breaking that lease — despite the fact he mounted an effort to build a new stadium to replace the dilapidated arena. "As everyone knows we have tried very hard to keep the Islanders in their original home...Unfortunately we were unable to achieve that dream," Wang said. Speculation had swirled that the team would make the Barclays Center its new home, though the arena is smaller than the coliseum and its sight lines are considered a bad fit for hockey games. NHL commissioner Gary Bettman shrugged off talk that the Barclays Center isn't well suited to hockey because of its size and U-shaped seating area. Bettman said the "intimate" arena would make for great hockey-viewing, and that arena officials were discussing adding more seats to boost capacity to about 15,000 — a size that works well in Winnipeg, Bettman said. Barclays Center developer Bruce Ratner called Wang a "hero" for moving his team to Brooklyn. "Charles got offers to move the team out of our state — very good offers — and Charles wouldn't do that," Ratner said. Wang said he would maintain 100 percent ownership of the Islanders. 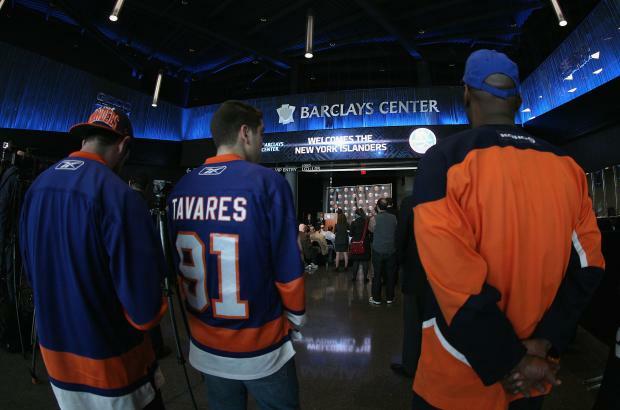 The Islanders have been negotiating a partnership with the Barclays Center "for years," according to the Daily News. Wang said he and Barclays Center developer Bruce Ratner first mulled the idea six or seven years ago, as Ratner was seeking approvals to build the arena. They began serious talks about six or seven months ago, Wang said Wednesday. The Islanders were scheduled to test drive the new arena in October against the New Jersey Devils, but the game was canceled because of the NHL lockout. The Barclays Center is slated to host some Russian hockey games as well. The Barclays Center, which opened Sept. 28, is the new home of the NBA's Brooklyn Nets.